I am introducing a new line of Eco Banners that include a Bamboo, Retractable Stand. It takes me 20 seconds to assemble these banners at a trade show, and we have a mini carry bag that looks like a kid's golf bag , to easily carry the banner to your next show..
Take a look at our retractable banners, made from Recycled Plastic Soda Bottles. I will introduce a table top retractable banner, size 8.5 x 12, with a mini, Bamboo Stand in the next few weeks. It will retail for $95 and may replace the need for huge banners. I plan to introduce it at the next Green Festival in D.C in late September. The large size banner is approx 3 x 7 feet. I will place the banner and the stand near the front of my space at a show. It captures the eye of visitors faster. For more details please contact Greg Barber, www.ecofriendlyprinter.com, 973-224-1132. 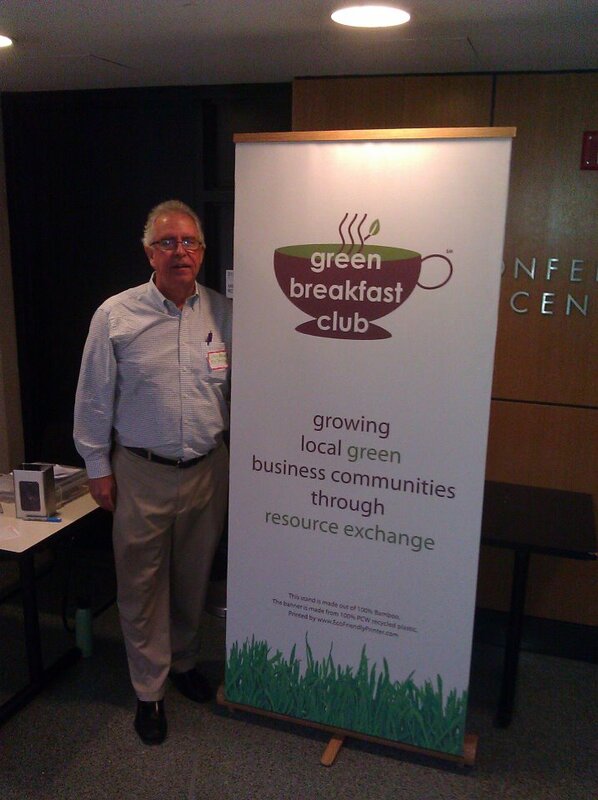 Photo: A beautiful 100% PET Bottle banner Greg made for the Green Breakfast Club - Green Breakfast Club provides a unique resource exchange and networking format to grow local green business communities through sharing resources.